Pradhan Mantri Suraksha Bandhan Yojana New Scheme will make your Raksha Bandhan Festival special. 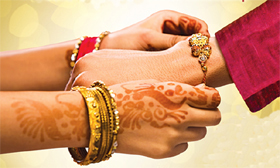 The government is planning to use upcoming Rakhi Festival to propose new Fixed Deposit scheme. Proposed name of this scheme is Pradhan Mantri Suraksha Bandhan Yojana. Prior to this Honorable Prime Minister has announced multiple social security schemes like Atal Pension Yojana, Pradhan Mantri Suraksha Bima Yojana (PMSBY) and Pradhan Mantri Jeevan Jyoti Bima Yojana (PMJJBY). Details of New Pradhan Mantri Suraksha Bandhan Yojana Scheme is given below. Under this scheme you can buy the gift instrument typically banker’s cheque or Gift Card and give it to your sister as a gift. Your sister needs to represent it in the bank. She can be deposit this gift in existing bank account or bank can open a new zero balance saving bank deposit account. Pradhan Mantri Suraksha Bandhan Yojana gift cards are available in three denominations 201 Rs, 351 Rs and 5001 Rs. The gift card of 201 Rs/- will enable premium payment of Pradhan Mantri Suraksha Bima Yojana for multiple years. The first premium of 12 Rs/- will be paid immediately and the second year premium of 12 Rs/- will be kept as reserve in saving bank account. Remaining amount of 117 Rs/- will be converted in the term deposit for ten years and will fetch interest rate of 8% per annum. Annual interest income of 14.16 Rs/- will be sufficient for annual insurance premium YOY. You can opt for gift amount of 351 Rs/- on Raksha Bandhan towards funding one-time insurance premium of PMSBY and PMJJBY. Total premium 342 Rs/- will be deducted and paid to the insurance company as a first year premium. The remaining amount of 9 Rs/- to be credited to the savings bank account of the insured. In order to continue the insurance for the next year one need to deposit premium amount. You can purchase gift card Rs. 5001/- on Raksha Bandhan towards funding insurance premium of PMSBY and PMJJBY for multiple years. Out of this amount of 342 Rs/- will be deducted and paid to the insurance company as a first-year premium. 342 Rs/- will be parked separately in a Saving Bank account of the insurer towards payment of second years’ premium. The remaining amount of 4317 Rs/- will be invested in the term deposit for five or ten years at the interest rate of 8%. Annual interest income of 345.36 Rs/- will be sufficient for annual insurance premiums, at the current rate, up to the date of the Term Deposit. This scheme will be launched on 1st August, 2015 and available throughout the year. One person can only enroll through one saving bank account for PMSBY and PMJJBY. No Guideline available if you get multiple Gift card under Pradhan Mantri Suraksha Bandhan Yojana. Before gifting under this yojana, you need to be careful in case recipient age is less than 18 years or more than 50 years he/she will not be eligible for the scheme. In case if the receipt is already insured by PMSBY and PMJJBY, the amount received as a gift card can be used to pay the premium of subsequent years. TDS is applicable for the fixed deposit taken under this scheme. Maintaining balance for the premium in the account shall be the responsibility of the recipient. Pradhan Mantri Suraksha Bandhan Yojana is one more step towards encouraging social security scheme through gifting. I am not sure that Pradhan Mantri Sneh Bandhan Yojana Gift card will be suitable gift for your sister on this Raksha Bandhan or not. However I recommend to gift fixed deposit or Mutual Funds on the name of your sister this Raksha Bandhan. Circular issued by IBA to Bank about Pradhan Mantri Sneh Bandhan Yojana. Hope you enjoy reading this post. Do share this information with others. Hi my age is 30 and i m a lic agent ..
You are eligible for Atal pension Yojana, If you are holding bank account and not enrolled in any other statutory social security schemes.